Hi Dies R Us friends! Vickie Y sharing a flat shaker card with you today. For my card I used a white top fold A2 size cardbase, a layering panel of patterned paper, watercolor paper, pastel watercolors, a piece of vellum, a scrap piece of pink cardstock, small flat confetti, and two dies from the Dies R Us online store. 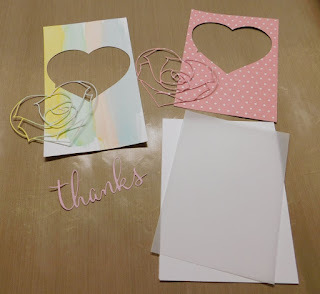 Need to also die cut the Heart Rose from the dotted patterned paper so you have the negative of the cut in the patterned paper and set the die cut aside to use another time. Die cut the PoppyStamps Fancy Thanks die from a scrap of pink cardstock. 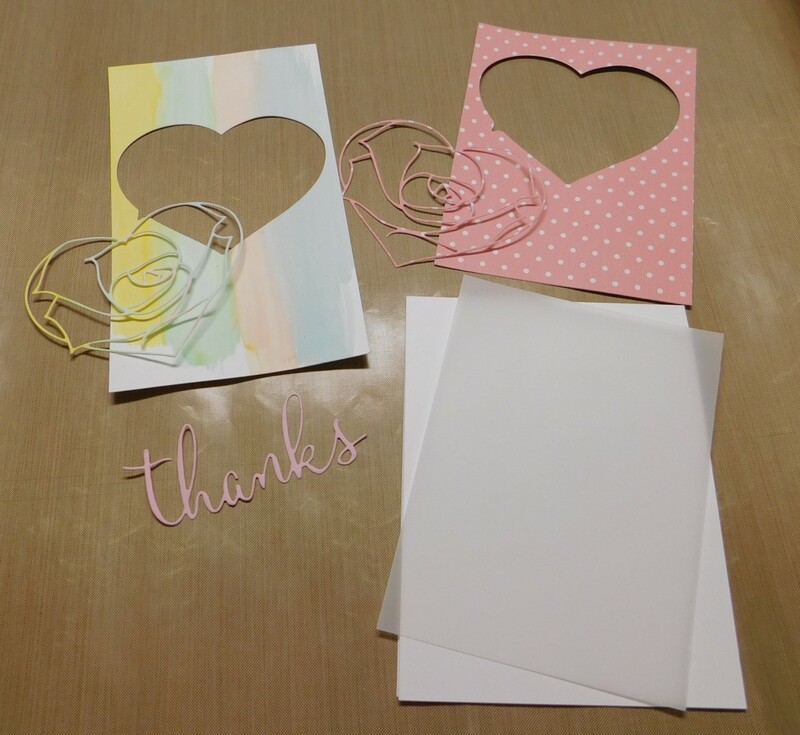 Shown above: watercolored panel with the Heart Rose die cut, the patterned paper layer with the negative of the Heart Rose, the die cut thanks, the A2 size cardbase, and a piece of vellum trimmed 1/8 of an inch small that the patterned paper panel. 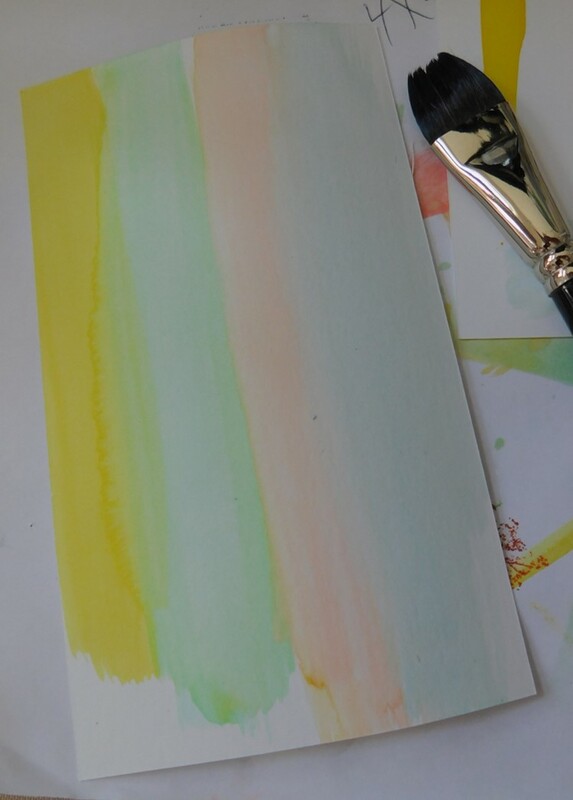 Flip the patterned paper over and apply your favorite adhesive to the backside. I used liquid glue. 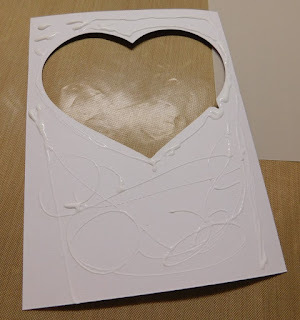 Adhere the piece of vellum to the backside of the patterned paper and then apply glue to the patterned paper being sure to outline the cutout with glue so that no confetti can escape once the card is put together. 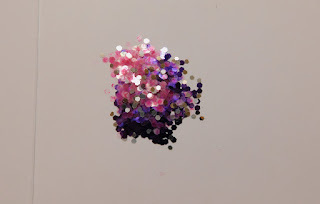 This is the small confetti I used. Next, open the cardbase and under the fold score place a small pile of the confetti where the patterned paper cutout (with the vellum panel on the back) will be adhered to the cardbase. Refer to the finished card for placement. 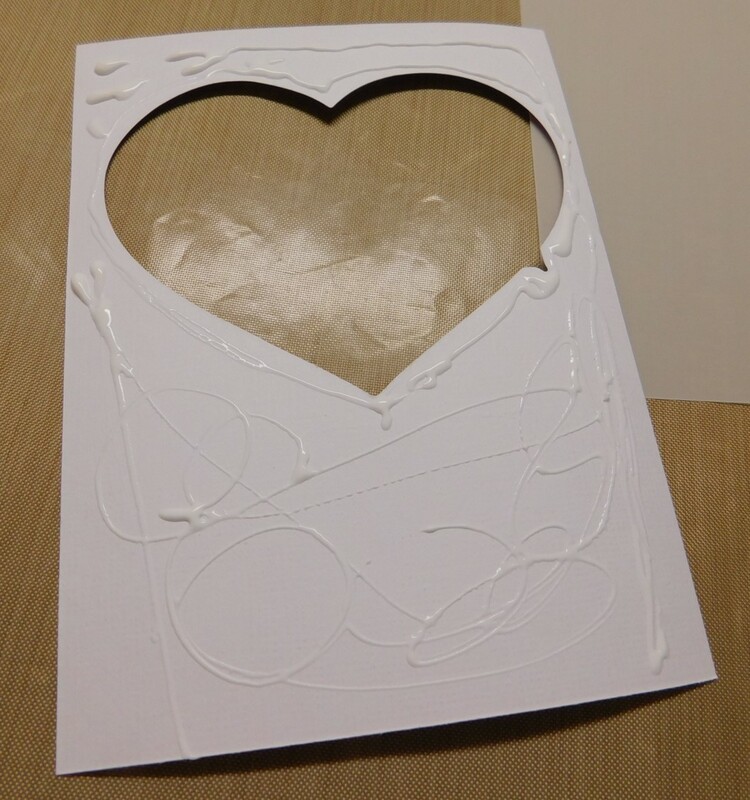 To finish the card, inlay the die cut watercolored Heart Rose over the cutout on the patterned paper layer, and add the die cut thanks (see finished card placement). This is so sweet and I love that it's a shaker too! The colored outline of the rose is stunning! 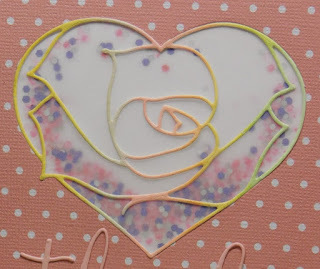 I love the delicate outline of a rose and it is lovely as a shaker card. 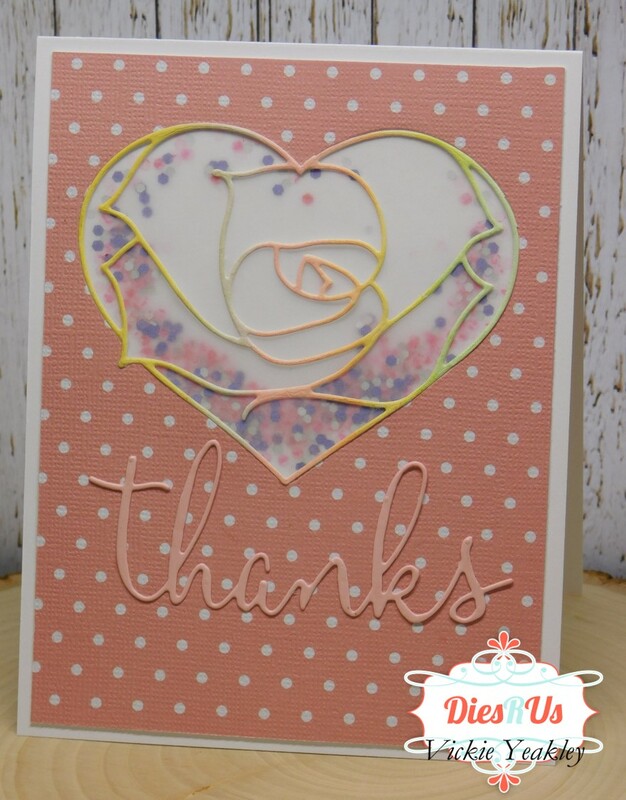 What a fabulous use of these die cuts and awesome design idea! Just beautiful Vickie ... thanks for creative inspiration! This is beautiful, Vickie! I love how you created your die cut paper. 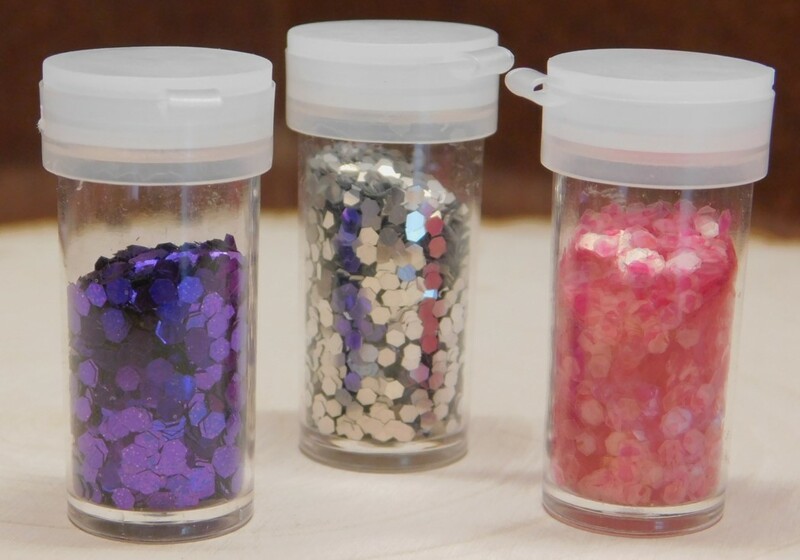 Fabulous shaker card! Such a great idea, Vickie!! Love how you watercolored the die. 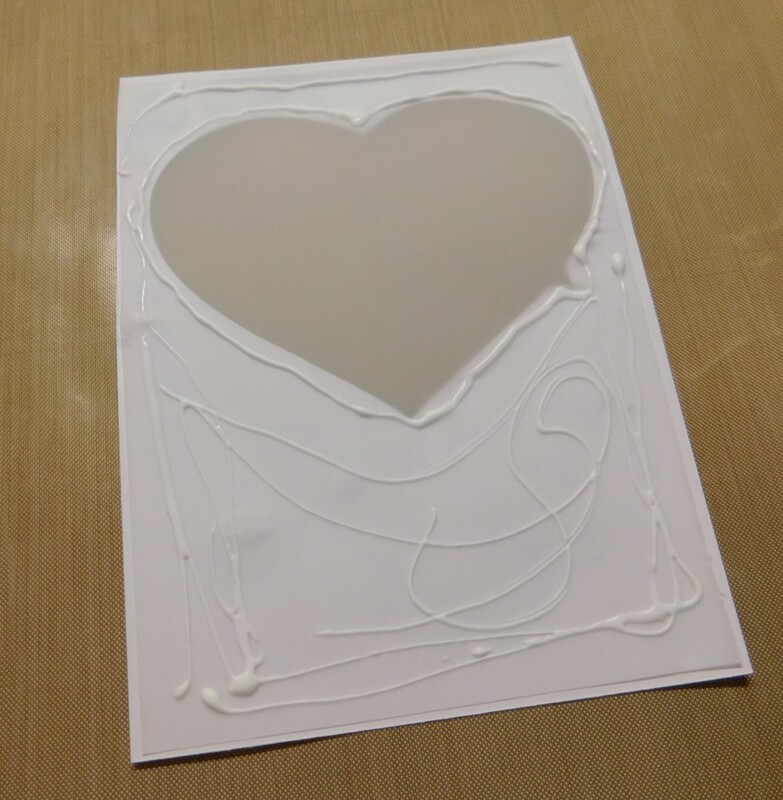 My only question is how you glued down the inlaid the rose heart die without messing up the vellum? Thank you, Cheri. I use a fine metal tip on my glue bottle and carefully dot the backside of the die cut to inlay into the negative die cut. Thanks for your question. Hope that helps. fantastic card, thanks for the instructions to make a flat shaker!